Mobile operator Vodafone has today claimed a “major milestone in UK telecommunications” by becoming the first in the country to test the new 3.4GHz radio spectrum band on a live 5G network, which ran between Manchester and the company’s HQ in Newbury (Berkshire). The move comes just one week after Vodafone secured a 50MHz slice of the 3.4GHz spectrum band – at a cost of £378,240,000 – as part of Ofcom’s auction (here), which represents the largest single block of the band so far awarded to any mobile operator in the UK. In order to carry out the 5G spectrum test, Vodafone used a site at its Manchester contact centre, which houses around 1,000 customer service employees, and its offices in Newbury. The test relied on a technology known as Active Antennae or Massive MIMO combined with 3.4GHz running over their core 4G network. The system used multiple antennae to send and receive data more efficiently, boosting capacity where lots of people are connecting to the network at the same time. “5G will improve the quality of our lives and transform how we work. This next generation technology will enable medical services that could save lives, from remote surgery to remote care for the elderly. It will enhance industrial applications, from automated systems to robotics, helping manufacturers across the UK boost their productivity. And it will enable families to share their experiences with loved ones wherever they are, thanks to innovations like augmented reality. In reality this is a useful development, albeit probably not quite the “major milestone” suggested above and that’s because testing 5G at 3.4GHz isn’t such a big deal. The technology itself is capable of working across a vast array of different bands, indeed Vodafone and EE have already conducted similar tests in the UK using the only slightly different 3.5GHz band (here and here). Unfortunately what we don’t get is any information about the exact point-to-point distance or what hardware, speeds and latency were achieved as part of the test, which would have been much more interesting. Incidentally you might be wondering why there’s a drone in the picture. The drone enables Vodafone to check on the status, as well as antenna position, of their 5G mobile site in Newbury without having to turn the service off. Now here’s an amusing game for our readers. 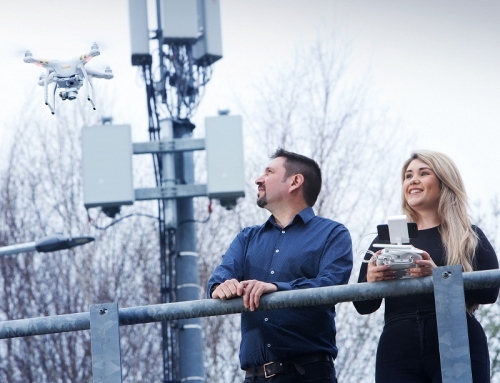 Hands up if you can answer this question, which of the two people pictured above (Jade Knight, Voda’s Head of Network Deployment for the South, and Peter Rodriquez, Head of 5G Delivery) is actually looking at the drone? I’m still not completely sure. I would say Jade Knight, but then again I never been any good at spot the ball either so I’m likely completely wrong! I worked with a guy called Peter Rodriquez and he was a [admin note: words removed due to possible racism] – so vodafone as doomed!